The NAP Linkage to Care program assists people who have newly tested HIV positive at an Omaha testing site with deciding to connect with HIV medical care. If one enrolls into the program, the Linkage Coordinator works with the newly tested participants in identifying locations and times that best suit their unique privacy and scheduling needs for each session. If the participant decides to engage with HIV medical care the Linkage Coordinator is able to join participants in their first two medical appointments, if scheduling permits, to help in the transition to care. Informed consent forms with the participant allow the Linkage Coordinator to obtain HIV lab reports, appointment attendance, and medications for a year to show improved health outcomes. The HIV treatment cascade, or HIV care continuum, is a model of HIV care that begins at diagnosis with the goal of viral suppression (achieving an undetectable viral load). This goal is achieved through early diagnosis, linking people to health care, helping them stay in care, prescribing antiretroviral therapy, and viral suppression. The Linkage to Care program focuses specifically on the second part of the treatment cascade–linking a newly diagnosed person to appropriate HIV care. 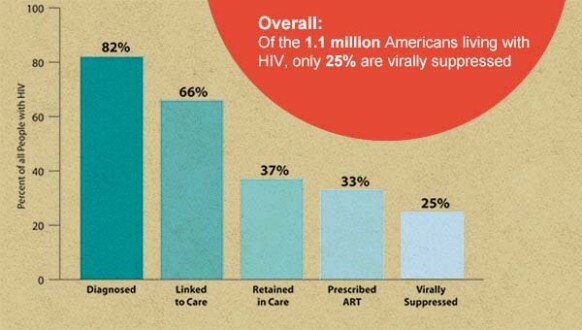 Per the chart below from aids.gov, of the 82% of people diagnose with HIV, only 25% have achieved viral suppression. As the cascade shows, people are lost in the treatment process at every step including not being linked to care, not being retained in care, not being prescribed medication, and therefore not achieving an undetectable viral load. An undetectable viral load substantially decreases the likelihood of passing the virus to another person which is why it is the ultimate goal of the treatment cascade.